3)when they want to make the glass rods for silver serving pieces. 4) when they want to make just about anything which has a hole in it….it all starts with the bubble in the first gather. This is a working furnace in Murano and the one where we produced the cane glass, our blown filigrana beads, wine glasses, vases, bowls, and bottles and a few thousand drawer pulls, wine stoppers, Christmas Balls, Glass Slippers and almost anything you can dream. This furnace has been making glass since the 1960s. 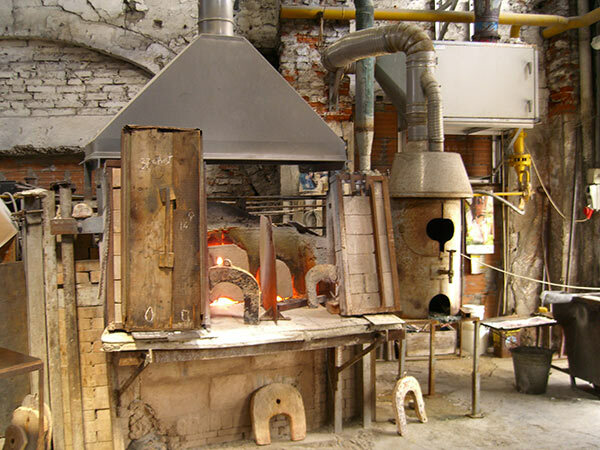 It is a production furnace, supplying handmade Murano Glass all over the world. It’s hot, it is heavy, it’s dangerous and it is not for tourist. And who better to make this glass, or so at least that is what I thought when I began a project with my dear friends at the furnace. Clearly having been a glass blower for some 40+ years, they could make the glass canes. Partly, the owner humored me, and partly he thought it was a good idea as well. Neither of us knew that the stubborn nature of Muranese and tradition would get in our way. It is the same process as making the zanfirico or the latticino which is used in all furnaces as decorations, just put a bubble in the first gather. Many of these furnaces also pull their own mosaic – millefiori or murrine. It just makes sense to “do it in-house”, you have the glass, the workers and then you know it is done properly and will be absolutely compatible with your other glass. 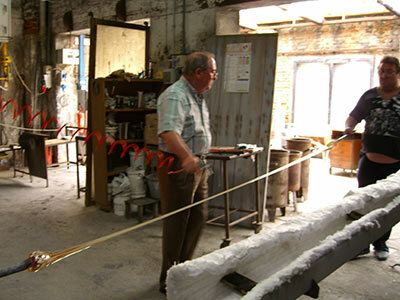 And the famous Effetre Moretti who makes glass canes used around the world, well they too pull it the same way. Claudio puts the bubble in the glass. Here you see Claudio – who, over the years, worked as a glass blower and sometimes a waiter. Some of you who have been to Venice to the demonstrations of glass blowing near San Marco Square may have seen him there as he moonlighted on the weekends earning a little neri (cash under the table). He spoke about 5 languages and arrived on the vaporetto each morning from Pt Sabbione – not a native Muranese. 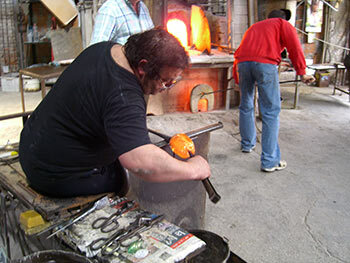 He is preparing the blow pipe to bring out the mass of glass that becomes the bubble. The bubble is crucial, because that bubble becomes the hole inside our cane glass. Now as you see, it is darn right difficult for us to control the exact size of the bubble and therefore we have great difficulty controlling the size of the hole! Once the bubble in inside, the next work, like making mosaics is to add on the layers of color or decoration. With each layer you add, your gather (the ball at the end of the punti) becomes larger and heavier. 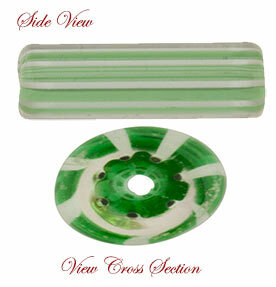 With the cane glass, we next add the color which is a thin layer when viewed from a cross section. The ball become quite large and it’s a lot like making taffy (just at a much higher temperature). The size of the ball will determine how much glass rod you yield, a delicate balance between making production and being able to control the cooling process so you don’t break the glass. When the ball is at the size you want, another glass blower arrives with a hot punti which he uses to attach to the other side of the ball, with the blow pipe still attached on the ball as well. Then it’s a ballet of blower and the glass to pull this ball out before it begins cooling. Here Franco is seen in the middle of the pull blowing cool air to cool the cane. I might point out here that this is also the reason our can glass varies in diameter, exact shape as well as hole size. A bed of insulation is prepared to drop the cane for further cooling. Next comes the conflict of tradition and need. The traditional way for canes to be cut is chopping, that’s right, like a guillotine. If you use this glass in the furnace, you do not need straight cuts, you heat it up and it become the decoration on an art piece. 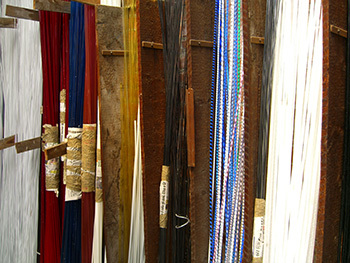 But our jewelry makers want nice straight ends so their earrings, necklaces, etc hang just right. It was a loosing battle against centuries of “that’s how we do it”. We did come to terms on fire polishing the ends, though they still are not perfectly straight, probably a major concession in Muranese history. And we did find a glass manufacturer in the US who makes precision glass. However, once they discovered we used it in jewelry, they more than doubled the prices per cut. Here’s our inventory of glass waiting to be cut – no make that chopped! So if you want to use our cane glass be prepared for a few irregularities on these absolutely – doesn’t get more authentic – Murano Cane Glass. Enjoy them!